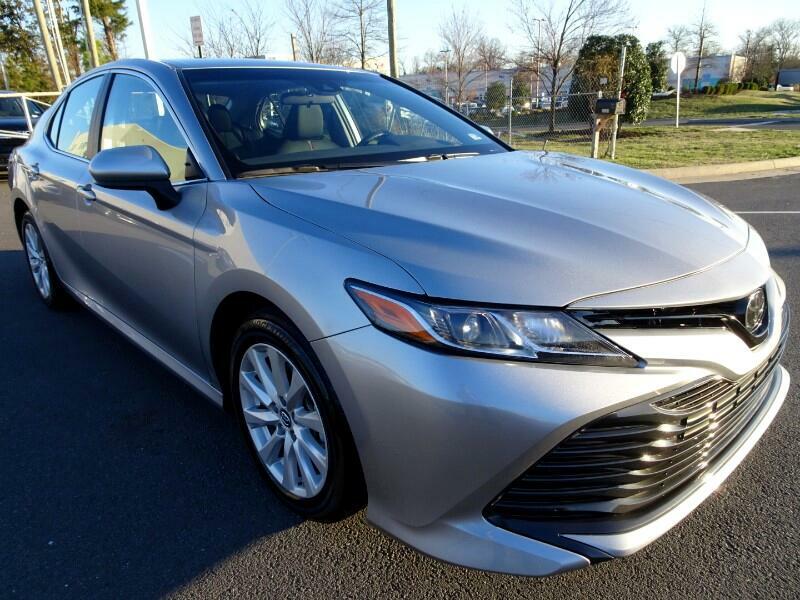 THIS IS A 2019 TOYOTA CAMRY LE, CLESTIAL SILVER METALLIC ON BLACK, ONLY !!!3,919!!! MILE'S, 1 OWNER, 39/28 Highway/City MPG - Air Conditioning, Climate Control, Cruise Control, Power Steering, Power Windows, Power Mirrors, Leather Steering Wheel, Leather Shifter, Power Drivers Seat, Clock, Tachometer,... Digital Info Center, Tilt Steering Wheel, Telescoping Steering Wheel, Steering Wheel Radio Controls, Driver Airbag, Passenger Airbag, Security System, ABS Brakes, Traction Control, Dynamic Stability, Rear Defogger, Intermittent Wipers, AM/FM, Alloy Wheels, Fabric Seat Trim with SofTex, Radio: Entune 3.0 Audio, 4-Wheel Disc Brakes, 6 Speakers, Front Bucket Seats, Front Center Armrest, Spoiler, Automatic temperature control, Brake assist, Bumpers: body-color, Delay-off headlights, Driver door bin, Driver vanity mirror, Dual front impact airbags, Dual front side impact airbags, Four wheel independent suspension, Front anti-roll bar, Front reading lights, Fully automatic headlights, Illuminated entry, Knee airbag, Low tire pressure warning, Occupant sensing airbag, Outside temperature display, Overhead airbag, Overhead console, Passenger door bin, Passenger vanity mirror, Power door mirrors, Power driver seat, Rear anti-roll bar, Rear reading lights, Rear seat center armrest, Rear side impact airbag, Split folding rear seat, Sport steering wheel, Telescoping steering wheel, Front beverage holders, Lane Departure Warning System, Exterior Parking Camera Rear, Auto High-beam Headlights Aux. Audio Input, Bluetooth, Center Arm Rest, Child Proof Door Locks, Daytime Running Lights, Overhead Console, Premium Sound, Rear Spoiler, Rear Spoiler, Rear-Side Airbags, Remote Fuel Door, Remote Trunk Lid, Reverse Camera, Roll Stability Control, Side Curtain Airbags, Tire Pressure Monitor, Vanity Mirrors, AND MORE!!! DON'T MISS OUT ON THIS GREAT!! !